Depending on requirements, a future policy that has not yet started could be considered as unearned as a whole. And an earlier policy that is completed (expired) can be considered as earned as a whole. Note that this may need adjustment to local requirements. Policy1 Is in effect now and is valid a complete calendar year. Policy2 Is in effect now, but ends after about 7,5 months after start date. Policy3 Ended in 2014, so it is not in effect. Policy4 The start date is at 2016-01-01 and the policy covers the whole calendar year. Policy5 Is in effect now and is valid about 19,5 months. TotalDays – This is the total number of days the policy is effective. Note that the DATEDIFF function returns the number of datepart boundaries crossed between the specified startdate and enddate. Therefore I add 1 to all DATEDIFF calculations to get 365 days for a year. Note that we cant’t add one day to both earned and unearned premium, since then we would have one day too many. (Thanks to Joe for commenting on this) In the code above, one day is added to the earned premium only. But be sure to investigate how policy periods should be handled in your own data. EarnedDays – Returns the number of earned days. This calculation handles three different cases. Policies not yet in effect, Policies completed, and Current Policies. UnearnedDays – Returns the number of unearned days. The calculation handles the same three cases as EarnedDays. DayPremium – The calculation for the daily premium is: Premium / TotalDays. 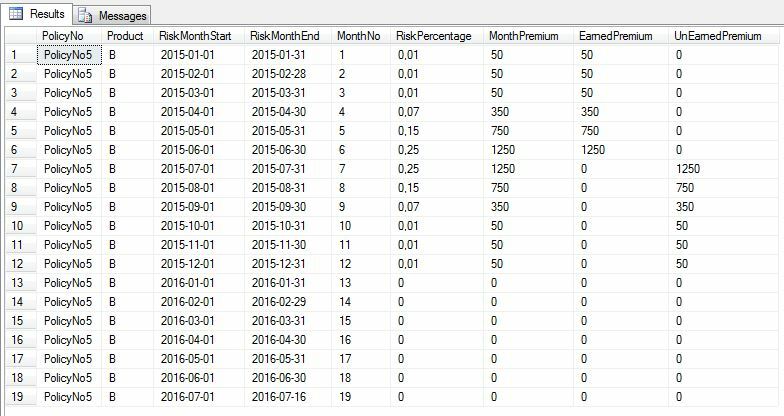 EarnedPremium – The earned premium is calculated by the statement: CASE WHEN EarnedDays = 0 THEN 0 ELSE Premium / TotalDays * EarnedDays END. UnearnedPremium – The earned premium is calculated by the statement: CASE WHEN UnearnedDays = 0 THEN 0 ELSE Premium / TotalDays * UnearnedDays END. The sum of column EarnedPremium gives us the total earned premium at 2015-06-30, and the sum of column UnearnedPremium gives us the premium reserve for the same date. In the calculation above, we distributed the premium proportionally (pro rata) along the number of days the policy is in effect. But some insurance products are earned in a more uneven way. Take for instance the seasonal risk variation in boat policies that carries a greater risk during the summer season than during the winter. Or a traditional warranty, that can carry a greater risk the longer the policy is in effect. What we want to do now is to modify the original T-SQL statement so that the seasonal variation comes into play. In order to do this we must first split each policy into as many rows as there are months in the policy. For each of those months, we want to return the weight (RiskPercentage) from above. To simplify things, we will consider the premium to be totally earned after 12 months. Therefore, the premium for month 13 and onward is 0. Further, if the coverage period is shorter than 12 months, we simply divide the premium into equally large parts. The sum of earned and unearned premium must always be 100% of the total premium. That’s why we need to create a function that handles all possible lengths of the policies. Also note that the calculation is done per month now, not by day. 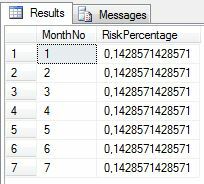 Of course, a risk per day could also be used. But beware of “data explosion”, that is, huge amounts of data since each policy is multiplied with the number of days it covers. To encapsulate the distribution over month calculation, I created a T-SQL function. This way the code becomes less complex, and a function is easier to maintain. 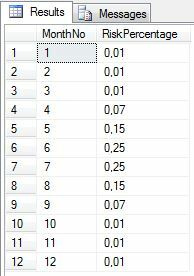 It is also easier to create and test many different premium calculations. But first we need a Numbers function, just to return a row for each month. The function simply accepts an integer and returns that many rows. The value 0,1428571428571 comes from the calculation 1 / 7, since we wanted to distribute the premium proportionally if the insurance period was less than 12 months. Since we calculate the premiums unequally per month, we must use one row for each month the policy is in effect. Let’s walk through each policy. Thank you for this tutorial! I’m working on calculating earned premium right now. I’ll add this to a function so that I don’t have to worry about it! I noticed that the Earned Days + Unearned Days is off by 1 from the Total Days figure. If you absolutely need Earned Premium + Unearned Premium to equal back to the original premium, you’ll have to get rid of one day. Maybe instead of adding 1 to both Earned Days and Unearned days after a date difference, you could add a half-day. Hi Joe, and thanks for the feedback! You are absolutely right, the number of days is one too many if I add it to both earned and unearned. And as you say, the solution is to add only half a day, or to add one day only to either earned or unearned. I’ll insert an update notice above. Once again, thanks for the feedback! going by your example , say Policy No 1 has endorsement of 200 in the month of May 2015 while Policy No 5 got cancelled say in Mar 2015. So how are we going to calculate the earned premium ? Hi, I would say the calculation is the same. But there would probably be business rules stating how the situation should be handled in the insurance system. If retroactive changes to coverage are allowed, then the earned premium changes. One Problem here If the policy will get issue after one or two month of Policy start date then this calculation will be wrong.